Look for Stephen Johnston most days from March to November and you’ll probably find him mowing the grass. Mind you, he’s not running a lawn care crew; rather, he’s fishing the vast vegetation that dominates the south end of Toledo Bend Reservoir. 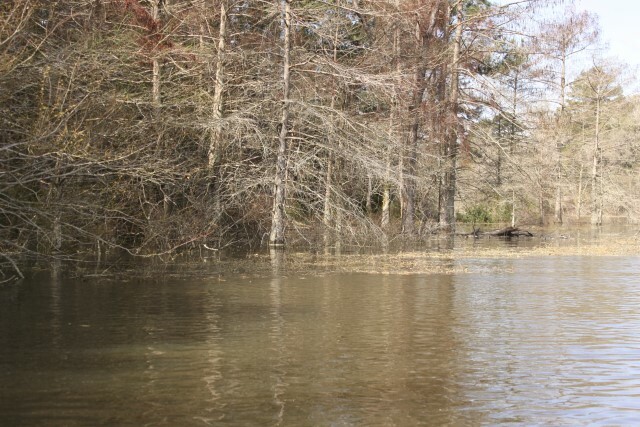 An impoundment of the Sabine River, this long, narrow lake straddling the Louisiana-Texas border holds lots of creeks, submerged timber and rocky structure, but if you’re fishing south of the Pendleton Bridge, your best spring-fall opportunities will be found in the peppergrass, hydrilla, coontail and milfoil. Collectively known as “grass,” this aquatic vegetation growing most prominently in Toledo Bend’s lower half plays an intrinsic role in a food chain that yields big-time bass action. Johnston’s stepson, Danny Iles agrees, adding: “The grass controls everything. You’re going to fish either in or around the grass all day long. You might not be right on top of it; you might be off casting within 10 feet of it, but the grass is still controlling where the bream are. The bream are the key to finding the bass. Johnston, a Toledo Bend guide and tournament pro, said the grass also helps maintain water clarity, while pumping a lot of oxygen into the lake. 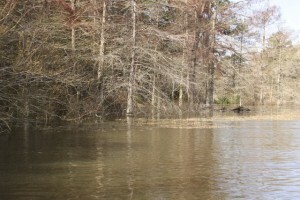 Add it all up and Toledo Bend’s aquatic garden anchors the lower end fishery. As Johnston notes, the lake’s Texas side has more flats conducive to grass expansion, but Louisiana holds plenty of vegetation too. Hard north winds can uproot delicate plant life, so look for the most consistent and continuous grass fields in protected bays with lots of trees to break the blow. Peppergrass grows in wispy stalks sprouting elongated green leaves that lie flat at the surface. Coontail takes its name for the bushy, brownish foliage surrounding its stalks, while milfoil’s upward slanting branches with green leafage surround its stalks resembles tiny Christmas trees. Hydrilla grows in long, tangled masses with individual green leaves grouped around the stalks. When peppergrass overtakes a shoreline, the surface leaves form a tight covering with lots of space below. Coontail and milfoil – both offshore grass that often intermingle – grow in clumps with solid form bottom to surface. Hydrilla, also an offshore plant, forms dense “walls” with most of its mass within a few feet of the surface and broad, shady spaces below these matted canopies. Johnston typically expects to find coontail, milfoil and hydrilla expanding by March. The latter reaches the surface and forms mats by July. Peppergrass will spread by April. Johnston said he likes the 10- to 18-foot depths for hydrilla, 6-10 for coontail and milfoil, and 3-7 for peppergrass. Winter kills the peppergrass, coontail, milfoil, and portions of the hydrilla. In the 8- to 12-foot range, some of the latter shrinks down to about two feet off the bottom. The fish that were living in the other types of grass typically move out to main lake structure in 30-40 feet, where they suspend relative to baitfish schools. In early spring, Johnston finds the fish sitting atop the new growth hydrilla, coontail and milfoil that’s still close to the bottom. Lipless crankbaits like the Sebile Flats Shad or the Strike King Redeye Shad work well in this scenario. As the grass becomes more established and fills out, Johnston will start working higher in the water column. “The fish stay around that grass, so when it gets taller, we’ll go to jerkbaits like (Smithwick) Rogues or (Cordell) Redfins, or swimbaits,” he said. Once the grass takes full form, the fish move into the botanical labyrinth, where shade and oxygen production create a cool, comfy environment with ample ambush opportunity. Here, your down baits are most effective. In matted hydrilla, go for the reaction bite by punching the thick stuff with creature baits like the Strike King Rodent or Reaction Innovations Sweet Beaver rigged on 5/0-6/0 straight shank hooks and capped with 1- to 1 ½-ounce tungsten weights. Punch skirts like those made by Paycheck Baits help baits slide through the thick layer of vegetation without hanging. Johnston often switches his creature bait for a 10-inch ribbontail worm in redbug, red plum or junebug for a bigger display on the fall. With any bait, he expects strikes to occur as soon as his rig clears the canopy. Bites are often light, as fish simply open their mouths and inhale what suddenly appears before them, so stay alert and set the hook on any change in weight or pressure. Jigs also work for punching in the hydrilla, as well as for flipping the gaps in coontail/milfoil. With the latter, go a little lighter and stay ready for strikes at any depth. Mornings and evening usually find the fish higher in the water column, while midday heat pushes them lower and deeper into cover. Texas-rigged worms, along with hollow body frogs will tempt fish in the coontail/milfoil. Because peppergrass grows shallow, flipping and punching are less practical than in the offshore stuff. Wiggling a light Texas-rigged worm or finesse jig amid the stalks may attract largemouth attention, but for the most part, this is a froggin’ deal. When the cool of early morning, overcast skies or rainy conditions find the bass chasing bait along the grass edges, crankbaits in shad, perch or crawdad patterns can be deadly. Depending on light penetration, relative to the cloud ceiling, bass will vary their depth along the grass lines. Therefore, Johnston recommends trying different size cranks to locate their position. Along the grass edges, Iles also likes a ½-ounce Falcon Lures spinnerbait with double willow blades. He’ll slow roll it over deep grass or burn the bait over taller grass. The key is ticking the tops of the grass. Whatever grass you target, remain flexible and don’t hesitate to move up or down in bait size and change colors until you determine what the fish want that day. The one thing you’ll want to keep constant is braided line. You’ll need that for cutting through the grass and pulling up a fish that’ll likely look like he ordered a salad on the way out of the restaurant.